Note: Some products in this post are sponsored but the opinions are 100 percent my own. Today’s the day you guys! For the last six weeks I have been sleeping an average of 6 hours a night, eating a steady diet of Costco cheeses and Nutella straight out of a jar, completely giving up any semblance of a social life, and have severely lowered my standard for personal hygiene just to bring to you this very moment… The BIG REVEAL of my Glam French Bohemian Rhapsody living room and dining room… Worth it? I’ll let you decide. 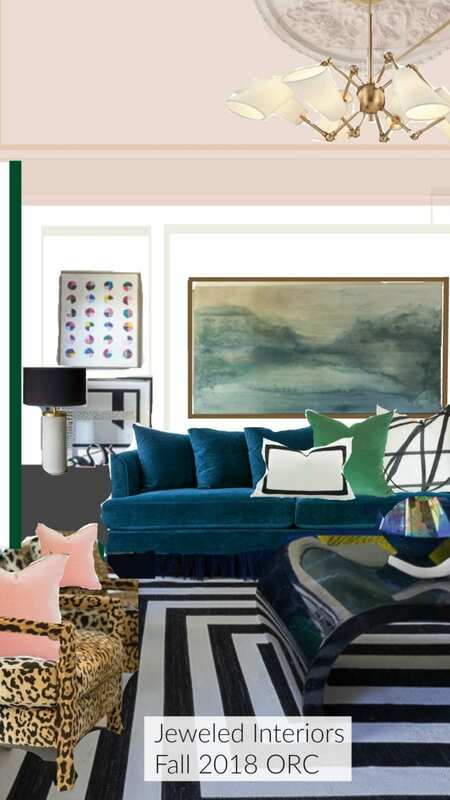 BUTTTTT…..first I want to add to the suspense by giving a huge thank you to Linda, from Calling it Home, for organizing this…the largest of all interior design blog link ups…more fun to follow than Meghan Markle’s barely growing baby bump… IT’S THE… 2018…FALL… ONE ROOM CHALLENGE👏👏👏! Woot Woot! Hopefully by now you’ve learned that this is a six week competition between a few dozen “Challenge Participants” and hundreds of other “Guest Participants” (like me). All of us have the goal of transforming our spaces with only a month and a half to get it done. 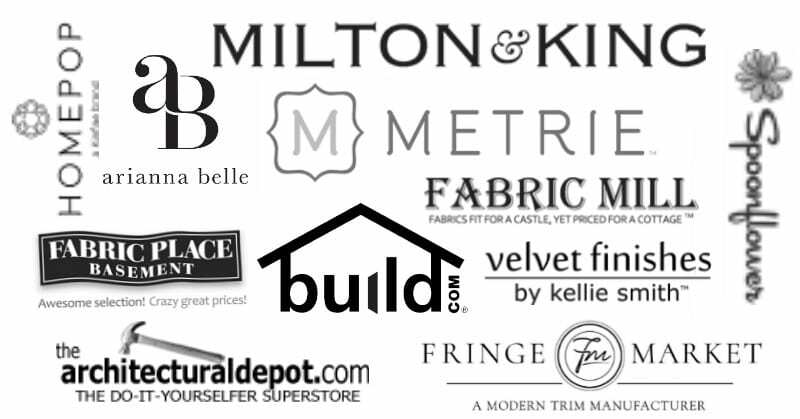 As an added bonus, there are two great media sponsors for this event, Better Homes and Gardens and Home Love Network. While they pick their favorites to showcase, the rest of us will be supporting and congratulating each other on a jobs well done. We made it folks and I’m so proud of us all! Now, one quick bit of house keeping before I give you the full reveal. By Bohemian, I don’t mean total boho. 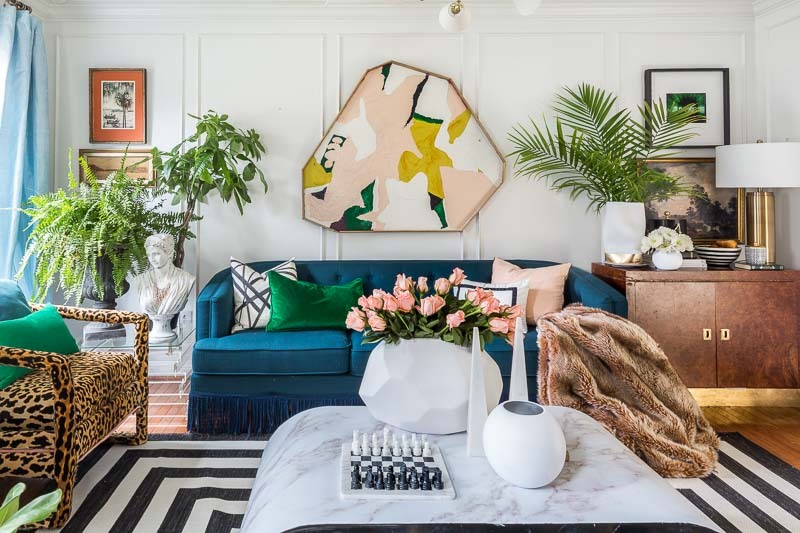 I ADORE boho in your house, but for me to do a complete switch to boho would be untrue to myself. Instead of boho, I actually mean French Bohemian. This term conjures up a romantic European image…Does it not? 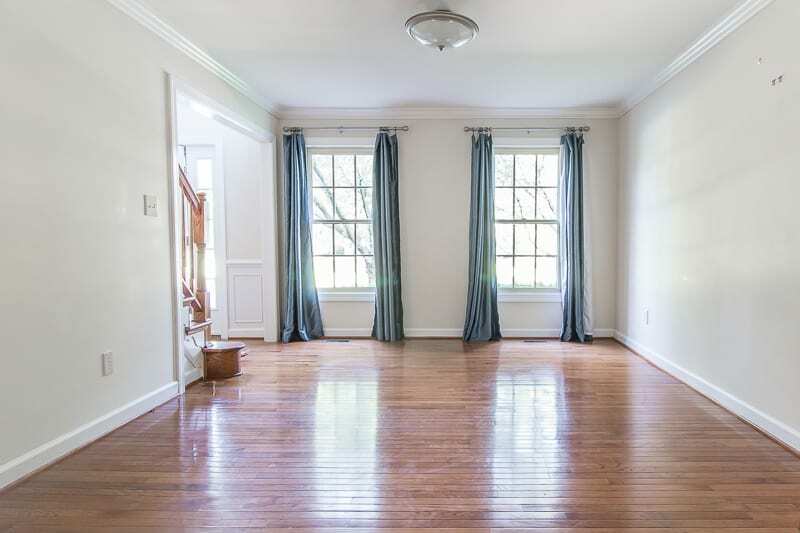 As an added bonus, my Glam French Bohemian Rhapsody Living Room and Dining Room gives me a fabulous excuse to use unlimited corny references to popular songs performed by the band Queen. I wasn’t born when Queen was popular (yeah right), but my 5 minute Google search now qualifies me as an expert on the subject. Do you think I can fit a dozen Queen references into one ORC Reveal post? Don’t stop me now! 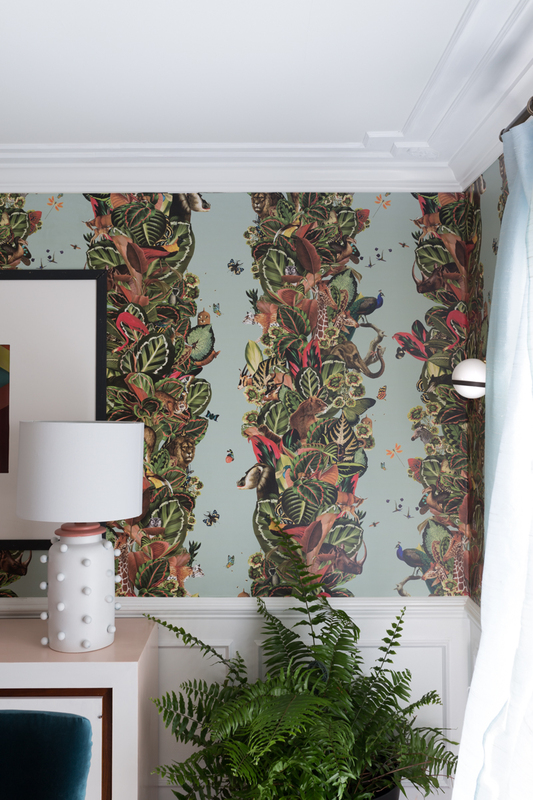 One of my favorite parts about this major transformation is this statement making Viva Tropicana wallpaper by Milton and King. Walking into this space is trippy…in the very coolest way possible! I mean, have you EVER seen anything like this? The scale is so incredible and the details are so fine that I can’t wait to invite some friends in to experience the magic of this room. Want more images and details on the wallpaper? Check out my Week 5 post. 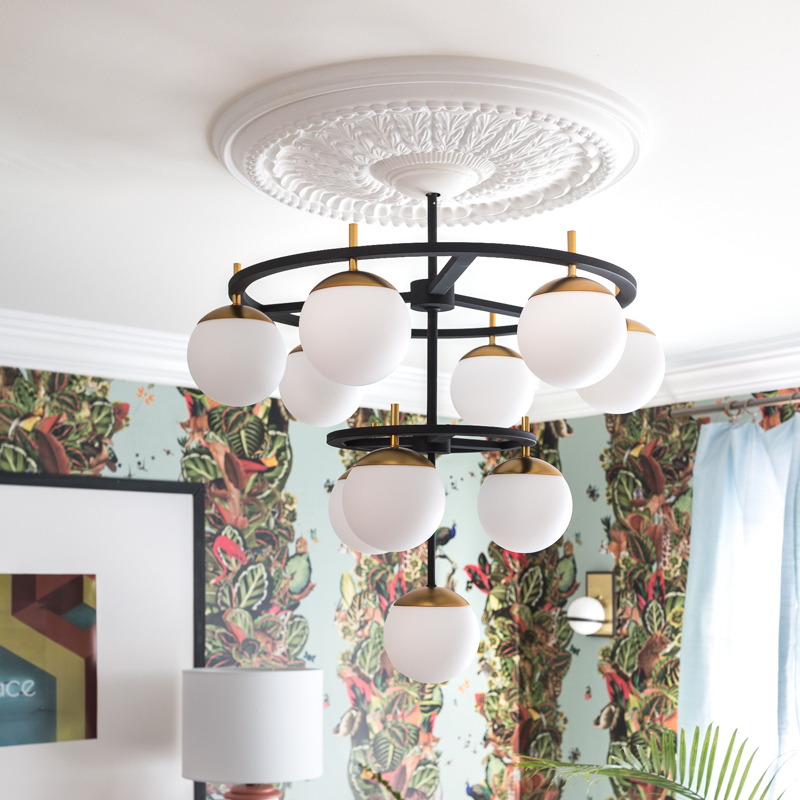 Speaking of statement making elements…Can I get a woot woot for this Kovacs chandelier from build.com? Holy smokes, it is spectacular! 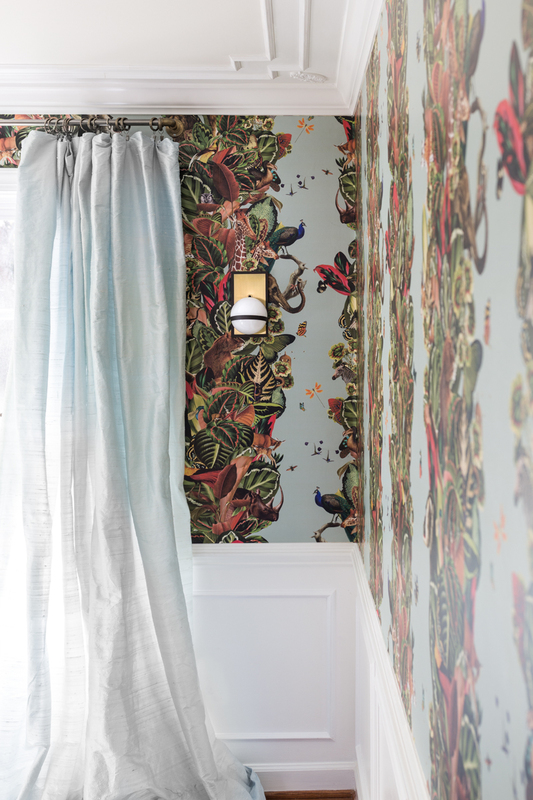 I needed something with some heft and presence to hold its own in this wallpapered room. I just kept coming back to this one. Man, I’m so glad that I did. 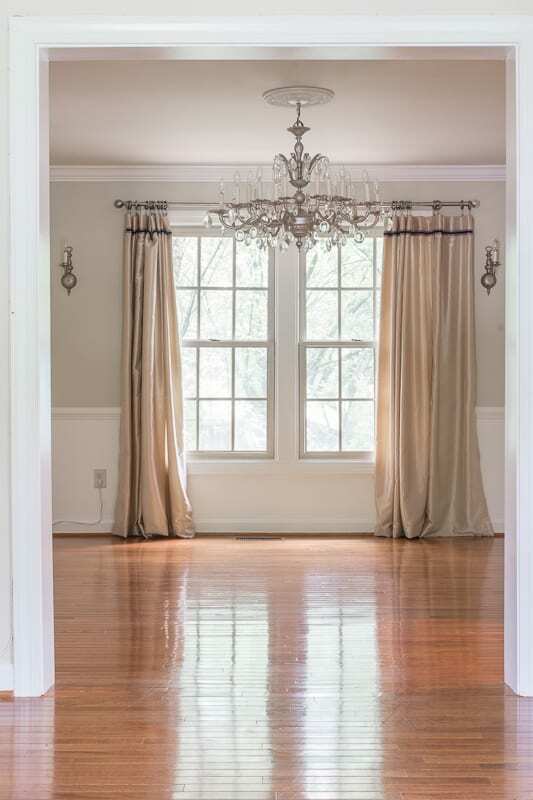 What better way to compliment stunning lighting than with beautiful ceiling medallions from Architectural Depot. 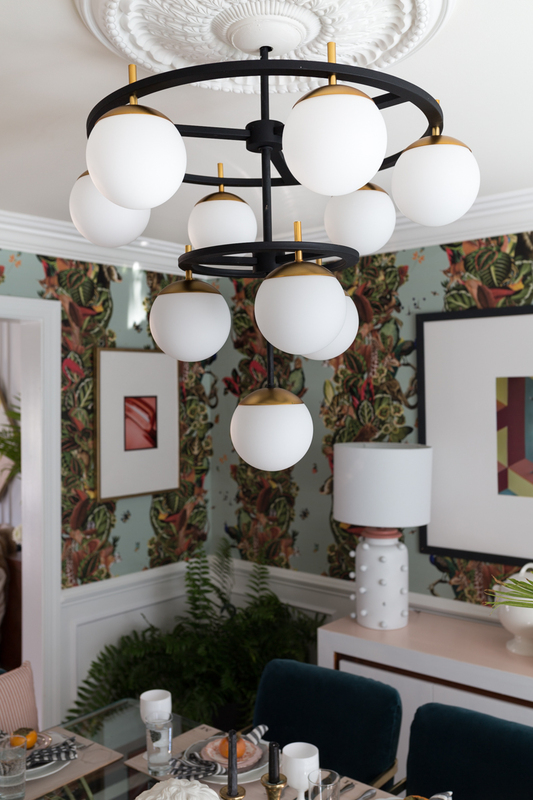 I love mixing old and new elements and the traditional medallion just feels oh so right with these modern chandeliers. 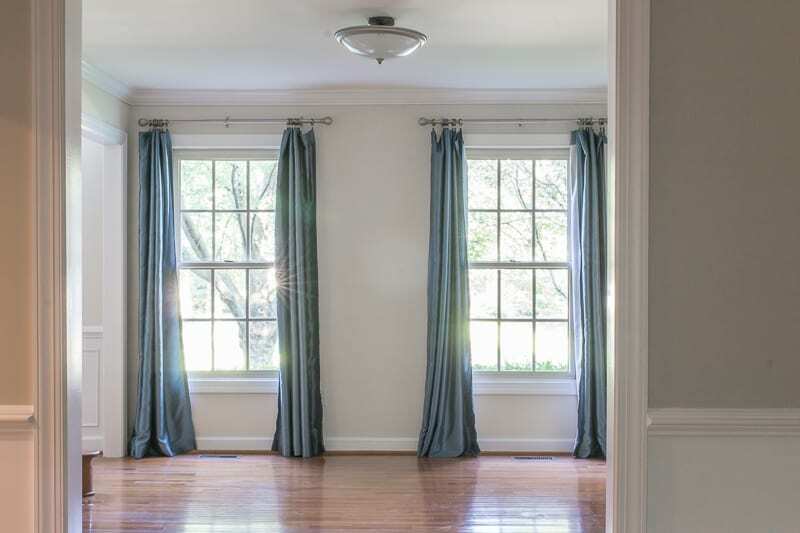 I’m convinced that we just added major resale value to our home and the illusion of six inches of visual height to these two spaces by installing Metrie moulding to the walls and ceilings. Working with Metrie moulding has been a fabulous experience and the ceilings and walls speak for themselves. Don’t you think? Click HERE to find out more details about our ORC week 2 Metrie Install updates. If you watch my Instagram stories then you know that this sideboard was a last minute effort. Let me tell you though, I’m so glad I didn’t skip this part of my design plan. 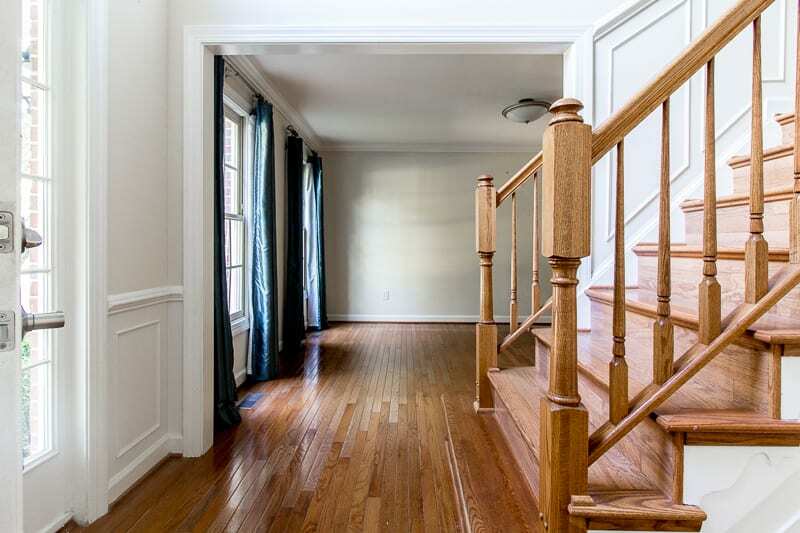 Luckily, Velvet Finishes paint is so easy to use! 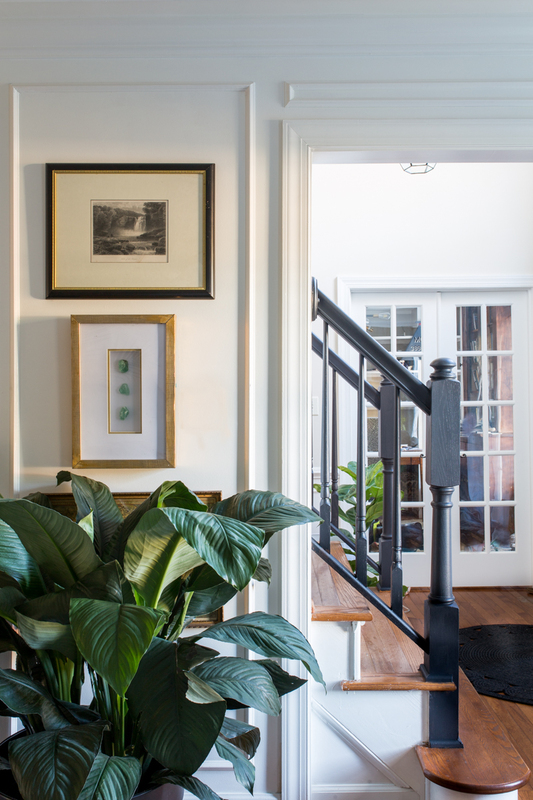 I also used Velvet Finishes on my stairs and a full reveal and tutorial will be coming at you soon…after the One Room Challenge…and a nap…and 10 loads of laundry. 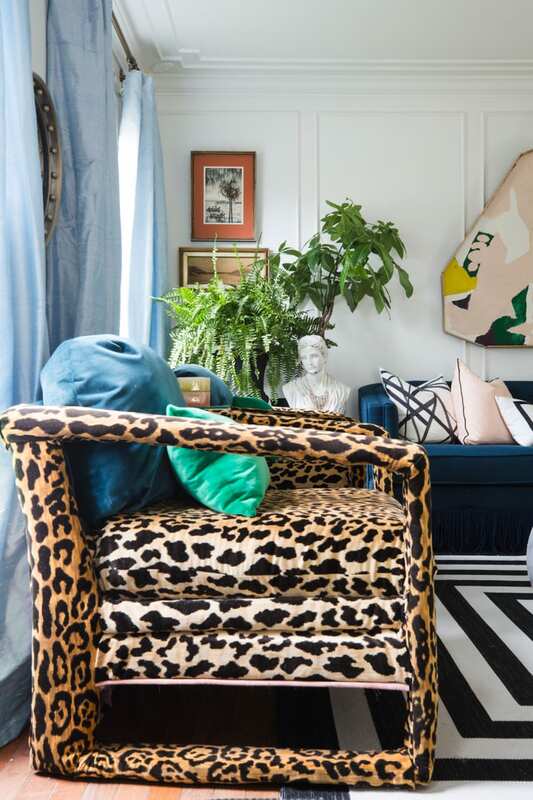 I have always wanted a pair of these Braemore Jamil Natural Leopard Print Velvet Chairs. I was happy to find this killer fabric at the Fabric Mill and upholstered them on the UGLIEST pair of vintage office chairs you ever did see. Don’t believe me? Click HERE! 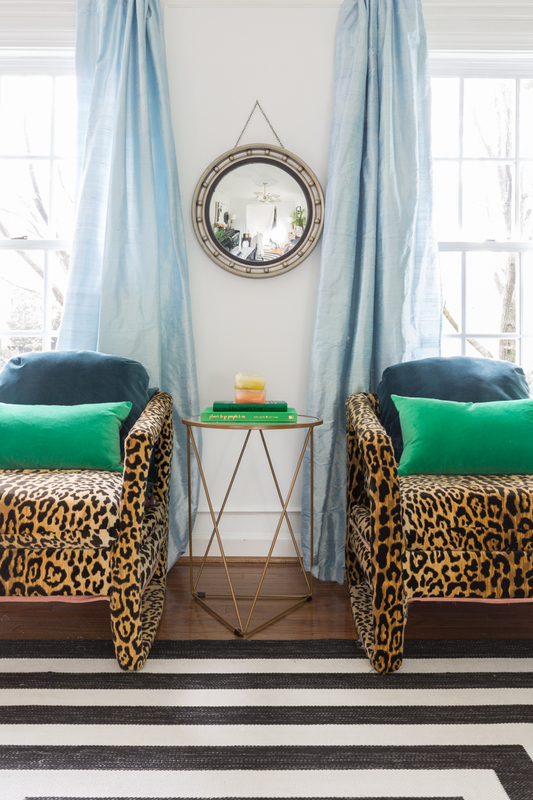 I needed some statement-making pillows to rest on these statement-making leopard chairs. Arianna Belle was able to help me decide on the perfect size and color. With their classic selection and helpful service I think we nailed these cute little green pillows! I have to admit something to you. I have ALWAYS loved the combo of a Kelly Wearstler Channels pillows in Ebony and Ivory paired with a Grosgrain Ribbon Pillow. Arianna Belle is a go-to place to find timeless and stunning pillows. 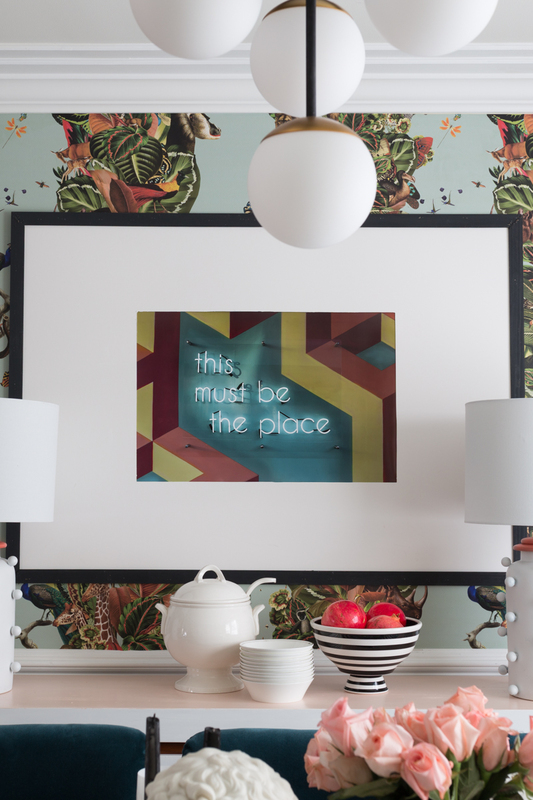 Isn’t this cheeky little end table from HomePop just perfect for this vignette? It has a glass top which makes it feel even more chic. 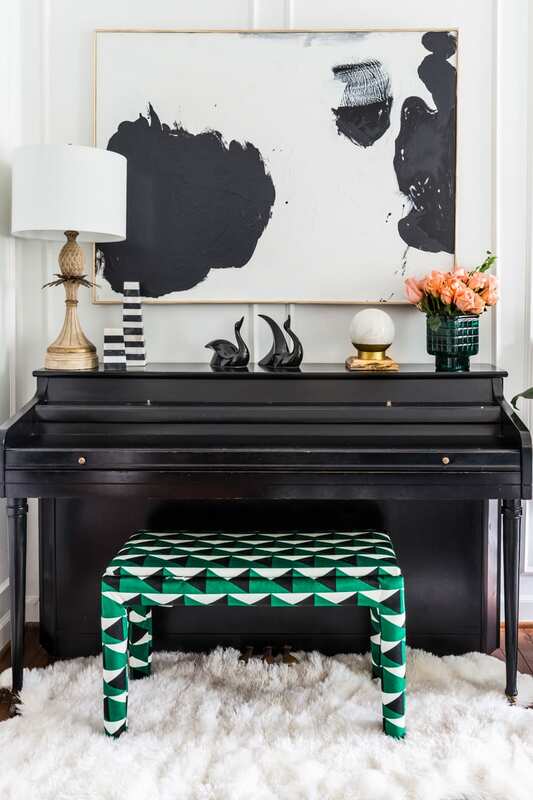 I upholstered my old piano bench in Spoonflower‘s spectacular Triangulos fabric in Celosia Velvet. My favorite thing about Spoonflower is that their selection is nearly endless and the patterns can often be adjusted by the artist. This particular pattern was custom designed for me by David Reynoso. Originally, I had planned to use it on a bed, but couldn’t get past how perfect it looks with my black piano. I will also be doing a tutorial on how to upholster cantilever chairs. I recently picked up this set of eight and used fabric from Fabric Place Basement to recover them. Trust me…They look so much better! 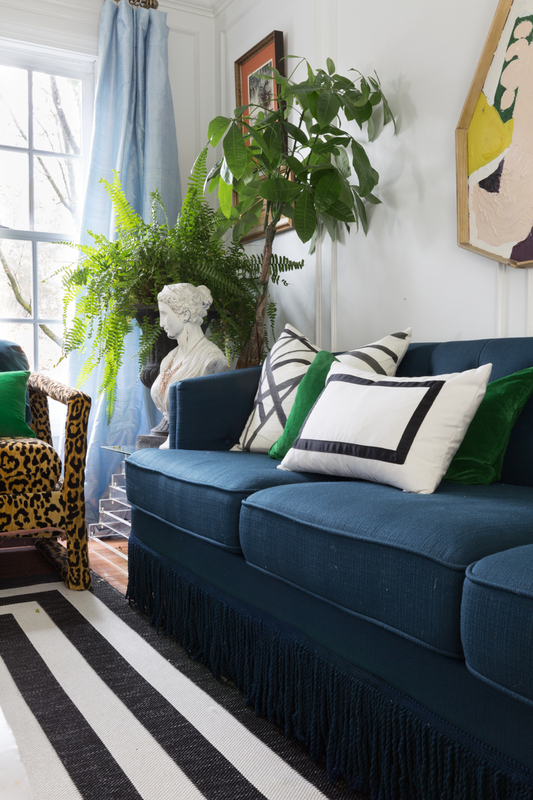 It isn’t Jewel’s sofa if it doesn’t have a little fringe. Hear me talking? Thank goodness for Fringe Market for feeding my fringe obsession! 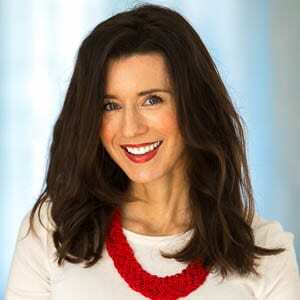 While I stayed true to the essence of the plan, hopefully you’ll agree that adjustments can be a good thing. I can honestly say that it has been a pleasure to work with such wonderfully supportive and responsive companies with such quality products. A HUGE THANK YOU! 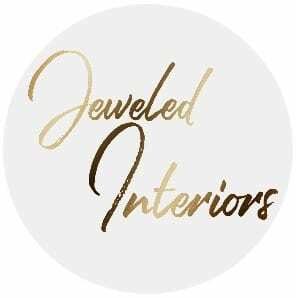 Thank you so very much for joining me on the Jeweled Interiors Fall 2018 One Room Challenge. If you like what you see here don’t forget come back and poke around a bit after the link-up. Oh, and following me is fun too 😜. Third One Room Challenge Complete. Another one Bites the Dust. And another one gone, and another one gone. Another one bites the dust. Its a magical dream salon! 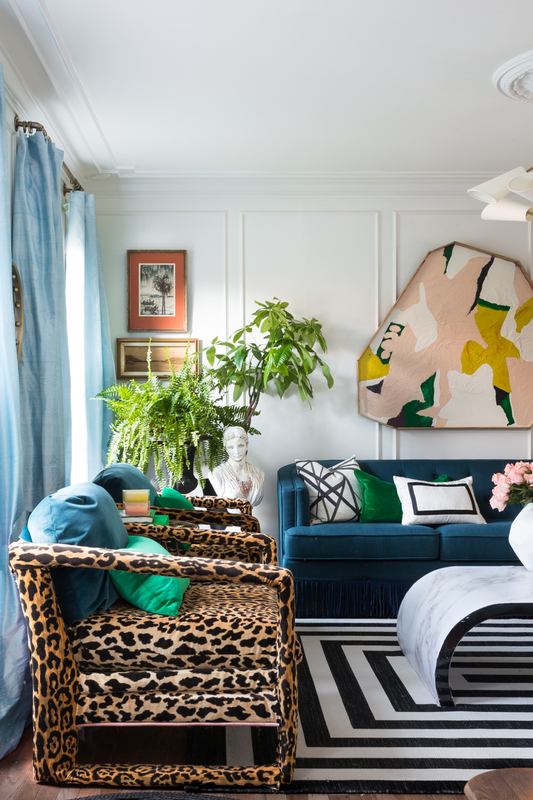 Love both rooms so much, the mix of pattern, color and traditional-meets-modern elements is amazing. Congratulations! 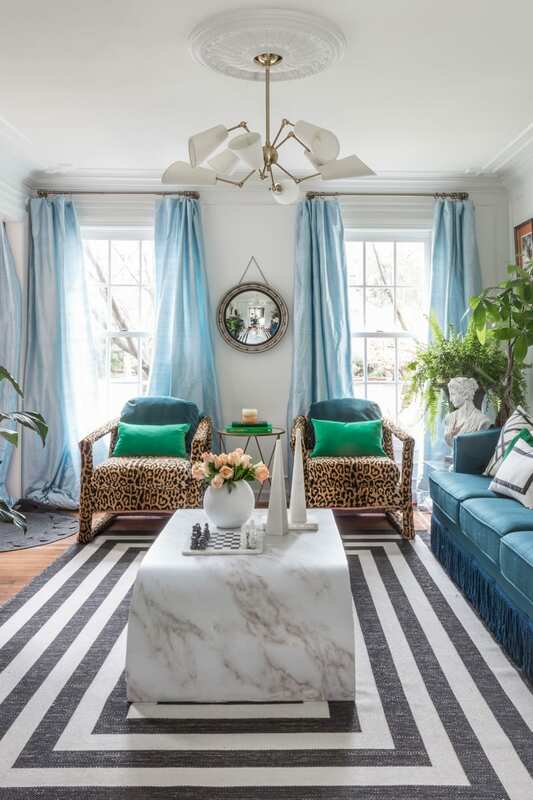 Wow those chairs really tie it all together, love this entire bohemian vibe of this space it is so fun and colorful, full of tropical and junglicous fun. Great job! Wow what a makeover -well two really. Just beautiful spaces. Love the new wallpaper, and both chandeliers are gorgeous. Great job. Thanks Danyelle. It feels great to be done, doesn’t it? Thanks Rebecca! I LOVE your kitchen!!! Wow, this is a magical makover! So colorful and dreamy! 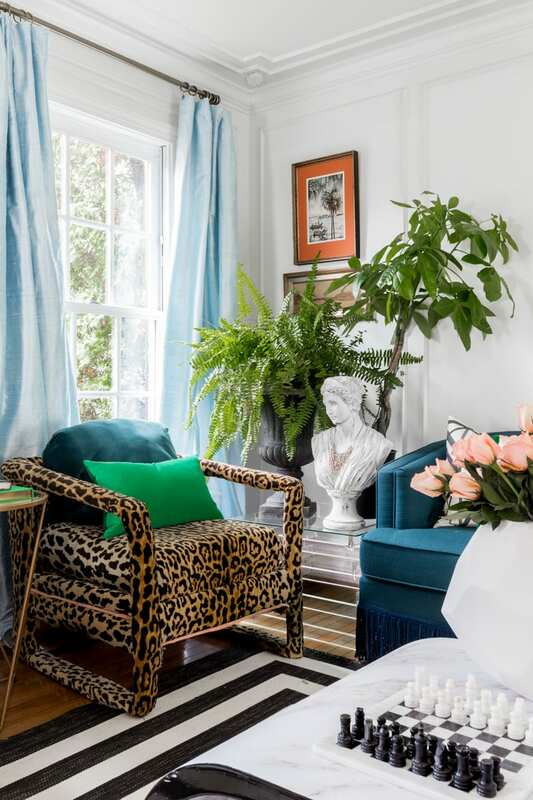 Love everything what you did in these spaces; truly glam and fully French Bohemian! LOVE IT! fantastic makeover Jewel!! so much drama and can’t believe did it all (so many DIY projects too) and to take your own photos in 6 short weeks! 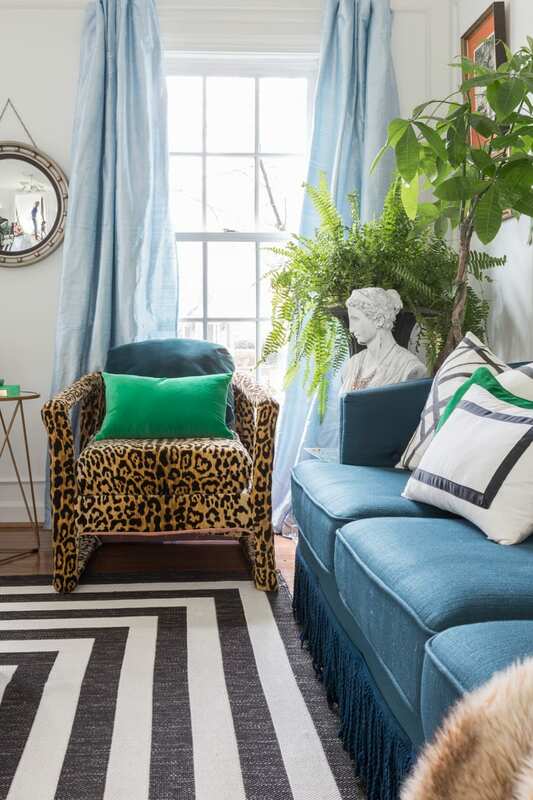 Such a treat to see your makeovers, especially when both rooms have their own personality yet sit perfectly next to each other! 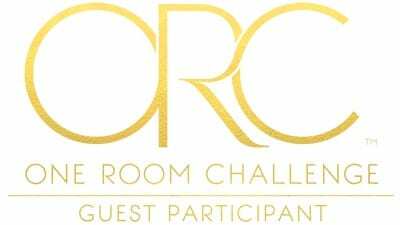 Bravo to another beautifully done One Room Challenge! I don’t know what I love most?!?!? It’s so beautiful and I’m a huge Freddie fan so it was like taking a trip down memory lane. You did him proud. “I like to be surrounded by splendid things”. You are ever-inspiring, Jewel!!! You are a sorceress of pattern and color. I don’t even know where to begin. 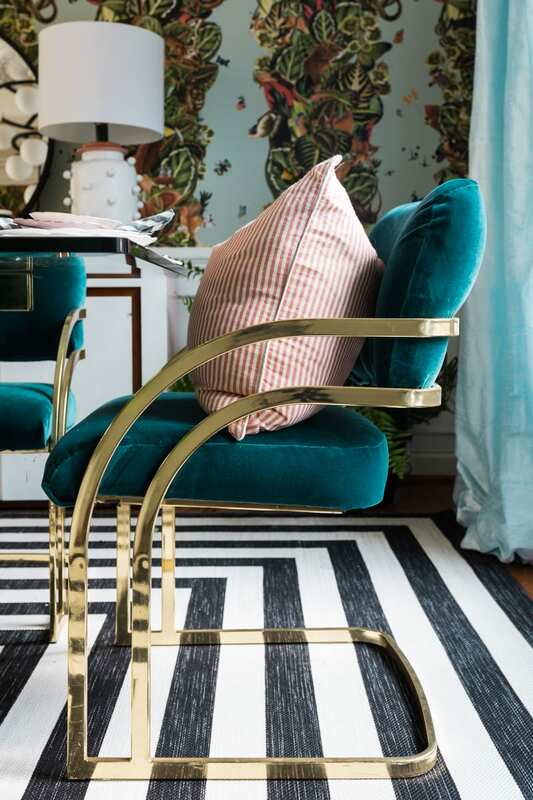 That wallpaper and those cantilever chairs paired together are straight up incredible. 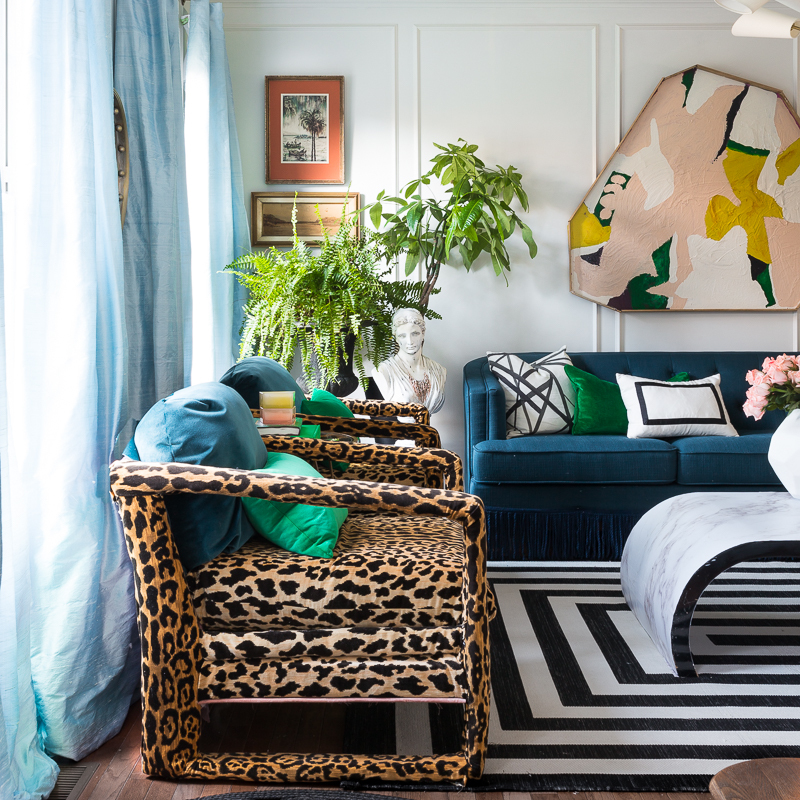 The artwork, the upholstery choices you made—the leopard, the geometric bench, that bluuuue—it’s just all so beautiful! So much eye candy. And don’t even get me started on the Queen references … HILARIOUS!!! Amazing job, girlfriend!! Congrats on finishing the ORC! Your rooms turned out amazing. I love how you woven all these bold pieces together so masterfully. Just gorgeous! ooooh it’s gorgeous! i love your coffee table- the wording under the image is not lined up and i can’t read it- can you tell me where you found it? Oh my goodness so many fun details and the hilarious references! The chandeliers are show stoppers, I LOVE those lamps, and the amount of work that you put into these spaces totally shows! Amazing work! Congrats and cheers on another ORC! Absolutely incredible job!! I can’t pick a favorite feature, it’s all so fantastic! Well done lovely! Thanks so much Jodie! It feels so great to be done and hope to be able to enjoy it all soon! BEYONNNND beyond beyond girl!! Looks SO AMAZING, I can’t believe you did everything you did! So much life and color, so good! It’s SO SO So good. I really love every single detail. It’s so perfectly you. It looks like it needs to be in a magazine feature. I’m also SO impressed by your upholstery skills! You totally killed it! I am so impressed right now, that you took on two rooms for this challenge. I think you should get an award or something for this. 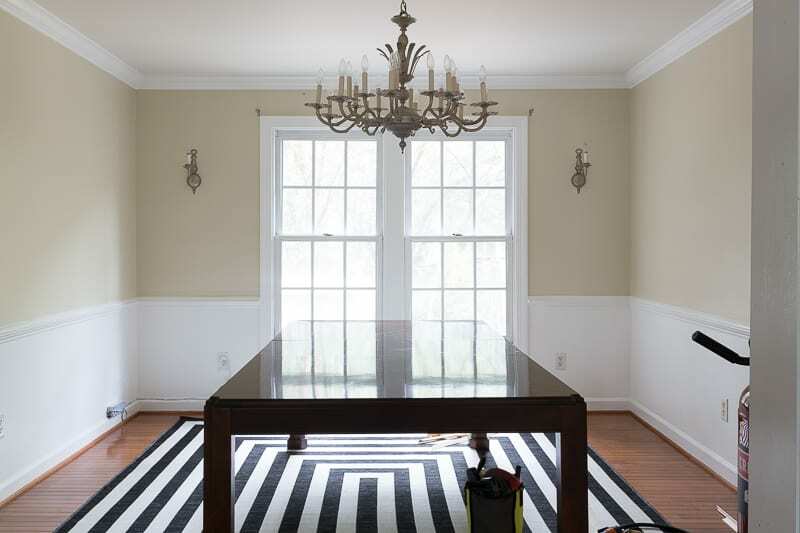 I have 10 loads of laundry and I only did one small dining room. 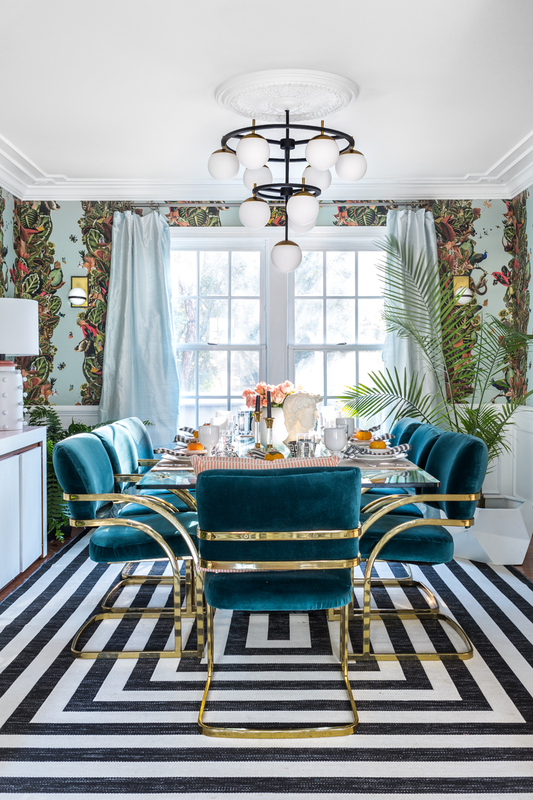 I absolutely love the wallpaper and lamps in your dining area and let’s talk about those chairs…totally stellar! 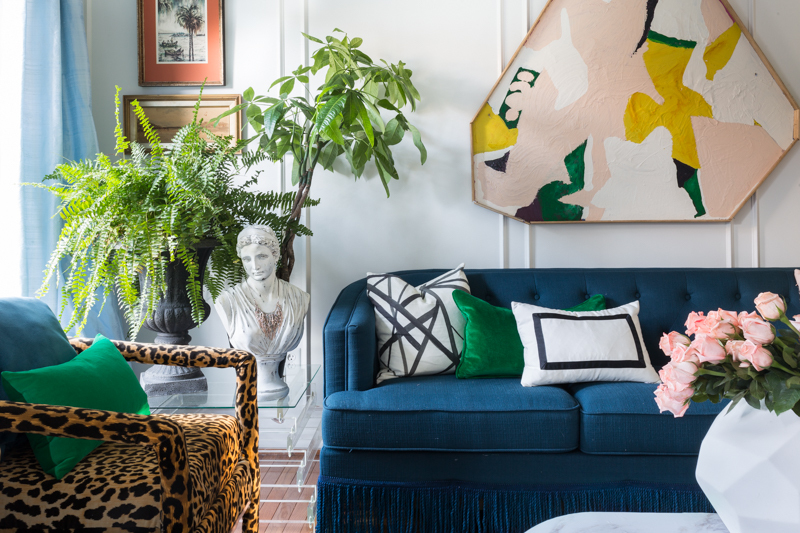 This is so much style crammed into one home. The chandeliers are incredible. Everything is so bold! You really outdid yourself here Jewel! I love how everything came together. Just one dose of awesomeness after another. Now it’s time to catch up on some much-needed sleep! 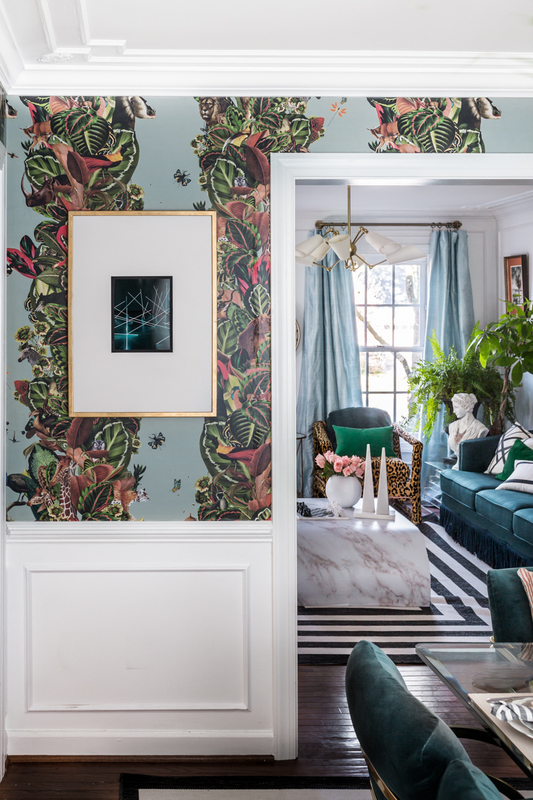 The amount of work you’ve put into these spaces is mind-boggling Jewel! They look outstanding! Nicely done chica! Oh my goodness Tiffany. That made my day! Thanks so much! Thanks so much Kenyatta! 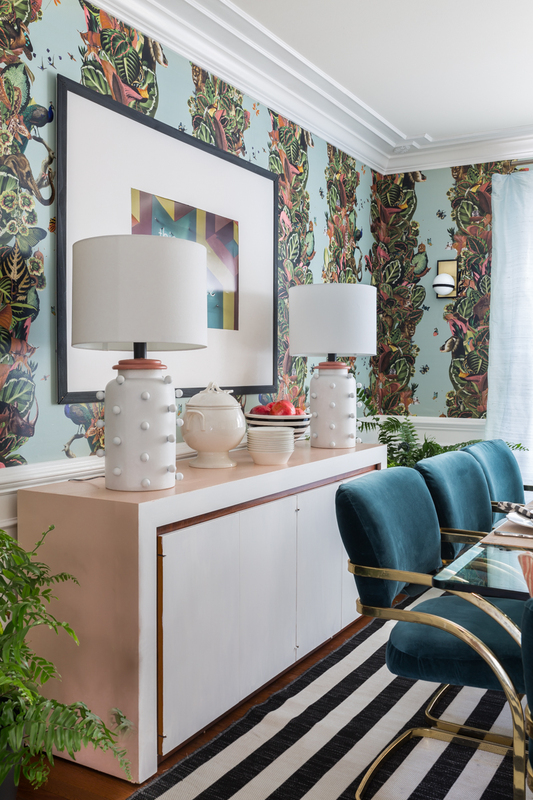 It’s definitely a fabulous experience to walk into the dining room with the Milton and King wallpaper! Thank you! Did you happen to catch the before pics of the chairs? So sophisticated and fun! It really is quite genius. Thank you so much Norma!!! 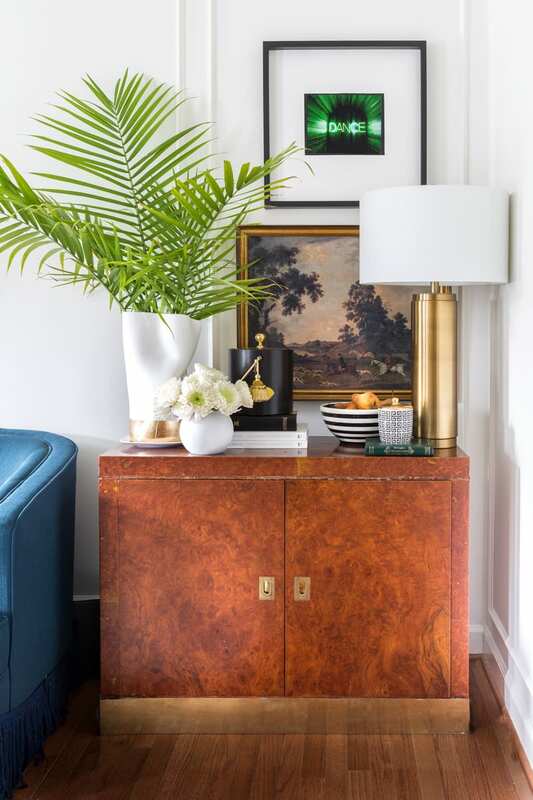 These spaces are both showstoppers. 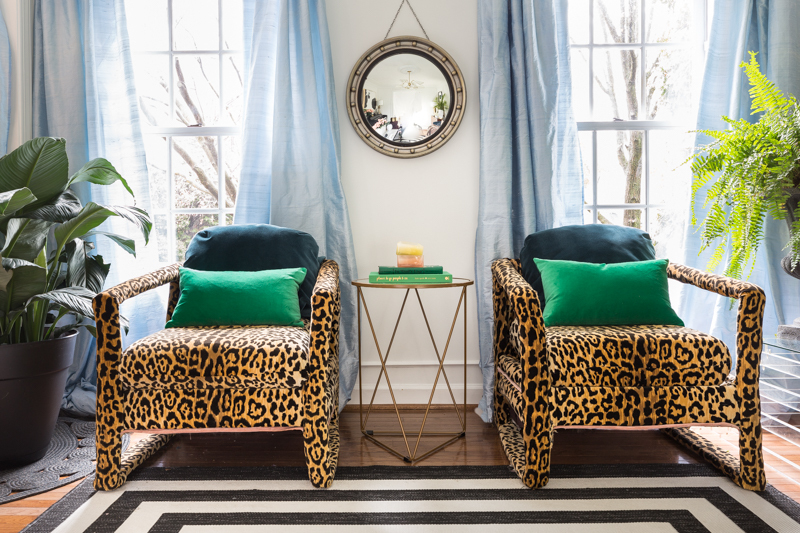 Those leopard chairs are everything! Stunning! I love all of your bold colour choices and they all work together so well! Amazing job on the leopard chairs. Literally my mouth is hanging open right now! This makeover is everything!!! 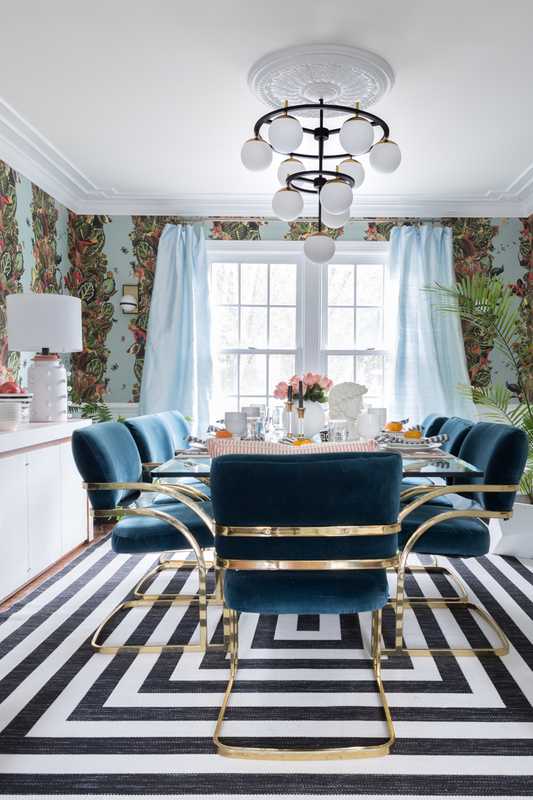 I couldn’t name all the things I love, but man that wallpaper and leopard print chairs steal the show for me! Congratulations on an amazing ORC reveal! This is fabulous! 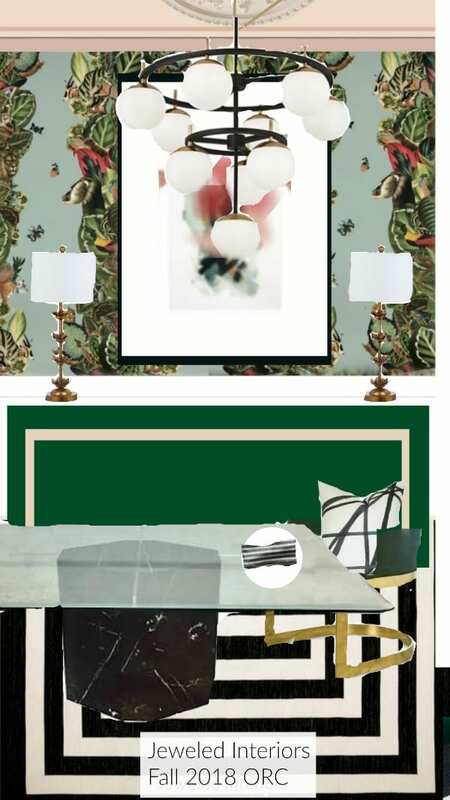 You didn’t mention the matching pair of lamps… white with knobs all around them… Would you please share the source!?! Thank you! I am dying. dying over how amazing, fabulous, gorgeous this all is. I am in awe. I have read it once but I will be scrolling and reading it again and again to look at every little detail. Perfection!! Thanks Sarah! I DIY’ed them with $8 thrift store lamps, marbles, and spray paint. Good luck! That is so incredibly kind Marcie. Thank you so much! Hi! I’d love to know more about where the artwork above the sofa is from? Thanks Carly. I made it with plywood, paint samples, oil paints, a miter saw, and a nail gun…I WISH I had made a tutorial. I would have purchased art, but where in the world would I be able to find something so custom, right? WOW! So beautiful, I love all the details and that light is gorgeous.